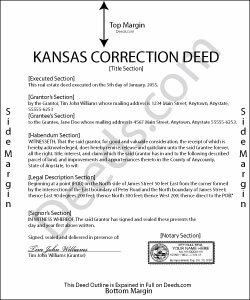 In Kansas, the correction deed is the most widely accepted instrument used to correct an error in a recorded deed. Many counties require, or at least prefer, the filing of a correction deed when making any corrections to the original instrument. It can be used to correct a typographical or other minor error, for example in the names of the grantor or grantee, their marital status or type of vesting, or in the legal description or any other information about the property. Although some counties accept a re-file affidavit when correcting and re-recording a deed, executing a correction or corrective deed is the more common method and guarantees that the state's legibility requirements are met (KSA 28-115(e)). The correction deed must make reference to the earlier deed that has already been recorded by date and instrument number and needs to indicate its exemption status from resubmitting the Kansas Sales Validation Questionnaire (KSA 79-1437(e)). As is required with any deed submitted for recording in Kansas, a new address for tax statements must be furnished with the new deed (KSA 58-2221). To make more significant changes, such as changing the way title is held (e.g. as joint tenant or tenant-in-common) or such as adding another owner to the property, it is best to record an entirely new deed instead of filing a correction deed. In order to release one name from a deed held in joint tenancy or tenancy in common, for example in case of separation or divorce, use a quitclaim deed.